Kahlua Coffee Chocolate Fudge Cake. Dense coffee chocolate cake with Kahlua liquor and rich, creamy chocolate frosting. 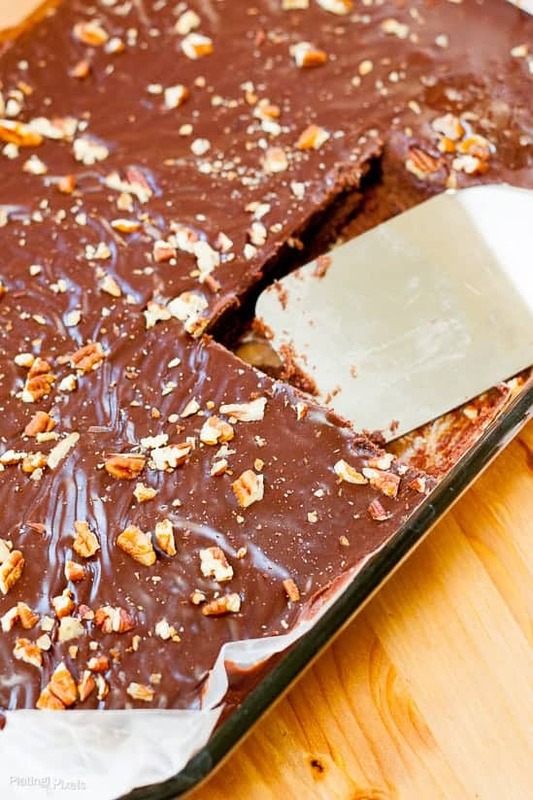 Easy to make chocolate cake. I hope you all had a wonderful and gluttonous Memorial Day weekend; I sure did. Every holiday, regardless of its original meaning, seems to have food associated with it. As a foodie, this is music to my ears; and taste buds. Olia and I spend the day barbecuing and hanging out with good friends. They had just gotten a super cute puppy named ‘Noodle’. I’m pretty sure that’s a temporary name. It’s a hound/black lab mix that isn’t quite sure how to use its long legs yet, so she’s a bit wobbly. This lovable creature and her dark chocolate fur leads me to this Kahlua Coffee Chocolate Fudge Cake. It’s a boozy cake, meaning yummy coffee liqueur as the main star of this dazzling recipe. Dense fudgy Kahlua coffee chocolate cake gets smothered with a chocolate and Kahlua frosting. Yep, that’s double goodness all in one beautiful package for you. This lavish cake is infused with rich flavor throughout. Don’t let the longer ingredient list dismay you. Besides melting butter, cocoa and marshmallow creme (which is critical to the successful flavor), this recipe is extremely simple and straightforward. It’s a joyous sight watching cocoa powder seductively blend with gooey marshmallow creme. You just know something wonderful will come out of this symphony. By the way, I said this cake was lavish; not going for healthy on this one. This is not a sponsored post, feel free to use any coffee liquor of your choice. Any with strong flavor will do fine. If recipe includes nuts (specifically macadamia, walnuts, pecans or almonds) I suggest toasting them, even if the recipe doesn’t call for it. You’ll get much richer flavor with a subtle smokiness. Both savory dishes and sweet desserts benefit from this. Toasting nuts is very simple and can be done in a pan on the stove or in the oven. To toast nuts ion stove, heat a skillet or nonstick pan to medium-high heat. Add whole or chopped nuts (depending on recipe) and cook 5–7 minutes, stirring constantly. They’re done once they are slightly browned and become fragrant. To toast in the oven, place on a baking sheet. Broil on low for 5–7 minutes, stirring midway. Watch carefully since they can burn more easily with this method. Pro tip: As soon as the nuts are perfectly toasted, remove them from the heat source AND the pan. Place on a plate in a single layer to cool. Otherwise, the oils in the nuts will continue to cook and burn. Texture: Dense, fudgy cake with smooth and creamy frosting. Dietary Options/Substitutions: For GF you may be able to use gluten-free AP flour, but I have not tested it. You can use other nuts like walnuts or almonds. Kahlua Coffee Chocolate Fudge Cake. Dense coffee chocolate cake with Kahlua liquor and rich, creamy chocolate frosting. Preheat oven to 350 F. In large bowl, whisk together flour, sugar, baking soda and cinnamon. In small saucepan, combine Kahlua (coffee liquor), butter, marshmallow creme and cocoa. Heat over medium heat, stirring occasionally, until melted together and just boiling. Remove from heat and stir into dry mixture until combined. In a small bowl, whisk eggs and buttermilk until combined. 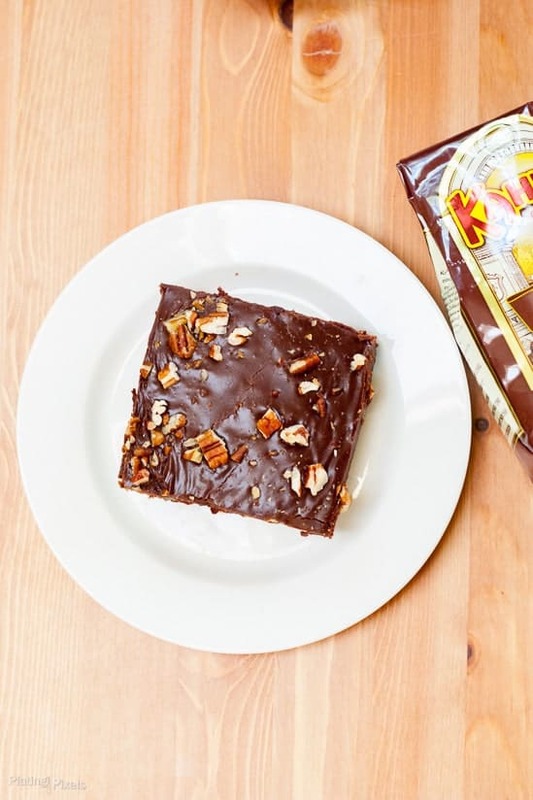 Whisk into cake batter, then fold in chopped pecans. 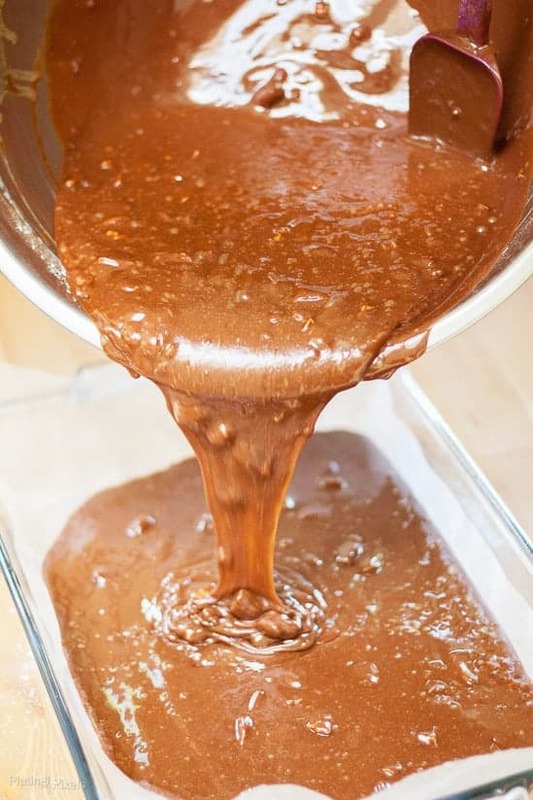 Pour batter into greased or parchment lined glass baking pan, roughly 15x10x1. Bake at 350 for 16–20 minutes, then remove to cool on a wire rack. (A toothpick inserted in center should come out mostly clean, but slightly damp. Be sure to not overcook or you will have a dryer cake-like texture. Slightly underdone is better as it will continue to cook as it sits). While cake is baking: In small saucepan, combine butter, cacao and marshmallow creme. Heat over medium heat, stirring occasionally, until just melted. Transfer to a medium bowl. Whisk in powdered sugar. Stir in Kahlua (a little bit at a time) until you reach desired frosting thickness. Evenly spread over slightly warm cake. Store leftovers covered in the fridge. Recipe adapted from Taste of Home: Five Star Desserts. Print. Winter 2014. Wait. We can have booze, coffee, and chocolate, all at the same time? Sold! You sure can Christine! That’s probably all I needed to write for the entire post and it still would have been just as enticing. Thanks! Holy Moses. You had me at Kahlua! Haha well put Anne! Thanks for the comment. Thanks for checking out my recipe and commenting Olyvia. I love all your blogging and social media tips! Thanks Natalie! I’m a huge fan too, and not just in my (occasional) weekend coffee. It’s great in desserts! 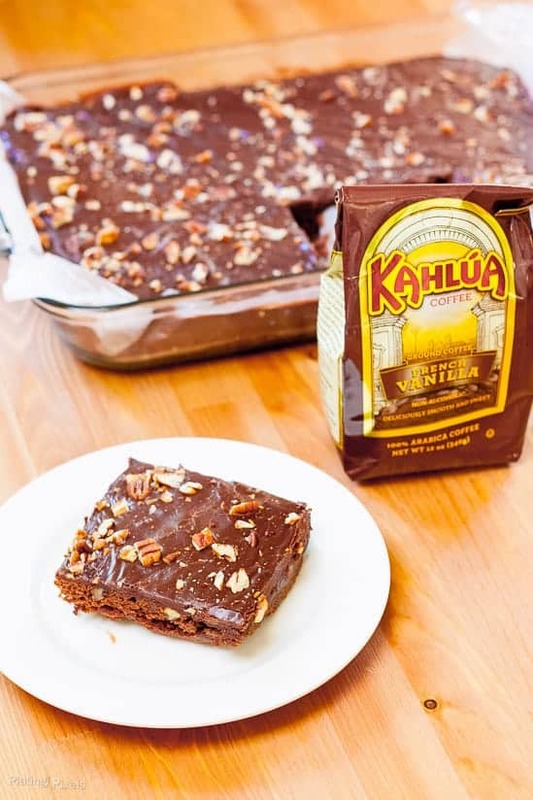 I love kahlua and this is such a good idea! I can’t wait to try this! Thanks Aimee! It’s a fun use of the liquor for sure.